The romantic, aromatic Libertine cocktail. The romantic, aromatic Libertine cocktail, created by Charles Joly at the Chicago cocktail den The Drawing Room, is festive on its own, but you can up the ante by subbing sparkling wine for the Gewürztraminer. Sparkling Gewürztraminer is a great choice if you can find it, or try another semi-sweet, floral sparkler like Moscato d’Asti. Whichever way you make it, don’t forget to vamp it with some blood-red rose petals. Twilight Eclipse DVD optional! © 2019 Kate Simon / Chronicle Books · Reproduced with permission. Fill a stemmed glass with ice. In a shaker, combine the absinthe, Gewürztraminer, 1 ounce vermouth, lime juice, and simple syrup and shake with ice until chilled. (NOTE: If using sparkling wine, leave it out of the shaker and instead pour it gently into the cocktail glass.) Discard the ice from the stemmed glass, shaking out excess water. Strain the contents of the shaker into the chilled glass. 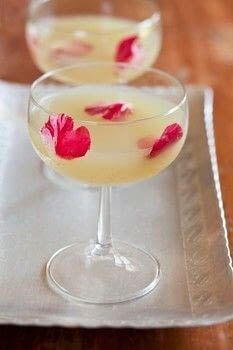 Top with the 3 drops vermouth and the orange flower water. Garnish.